PITTSBURGH, Penn. 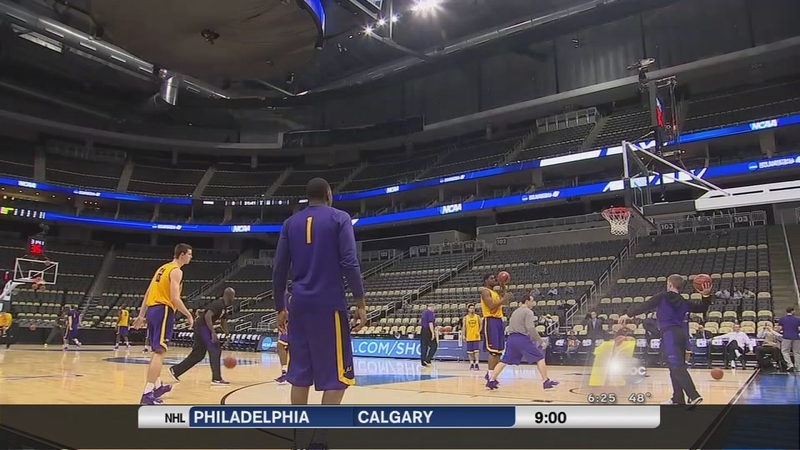 (WTVD) -- The path to Pittburgh for NC State and LSU means meeting for the first time ever in school history, but the road that led these two teams here is connected in more ways than one. At the helm for both teams are two head coaches who have crossed paths before. NC State's Mark Gottfried and LSU's Johnny Jones worked together for one season in Tuscaloosa; Jones served as an assistant coach on Gottfried's Alabama staff during the 2000-01 season and forged a friendship that has sustained itself over the years. Fast forward fourteen years to Selection Sunday. The two coaches chatted about their teams' postseason chances, but this time the phone call's end brought a bit of shock. "We talked for a little bit, and we hang up," Jones said before LSU's practice on Wednesday. "Then we have our team together and are watching [Selection Sunday], and I see the name come up. Yes man, [Gottfried's] in. Shoot, right below it, we come up. Wow." The wow factor extends to the court for Wolfpack guard Ralston Turner. Turner began his collegiate career at LSU, starting 58 games for the Tigers before transferring after two seasons in 2012. To say that this game doesn't bring up old memories is an understatement. "It was probably one of the toughest decisions I ever made [to leave LSU]," Turner said. "I don't regret it." Now, the statement that the Wolfpack need to make in their second round showdown pertains to containing a fearsome front court in LSU sophomores Jarell Martin and Jordan Mickey. The duo have combined for 29 double-doubles this season and led the Tigers in scoring in all but eight of their games on the year. "I've known about them since high school," Wolfpack forward Kyle Washington said. "They have a lot of versatility and play extremely hard. We just have to come to play." "Both of them obviously are very talented," Gottfried said. "I think they're very comfortable playing for Johnny in their system. They're getting the ball a lot more, in my opinion, here lately. They've been very effective." Both teams also boast youth in the majority of their mintues. LSU's only upperclass starter is junior Keith Hornsby, and the guard is the only player on the team with NCAA tournament experience. For the Wolfpack, three of the team's starting five are underclassmen. With such inexperience, both coaches understand that focus during the Big Dance can be a deciding factor. "When you get to this level, if guys don't understand the sense of urgency they have to play with and what's at stake and there's no tomorrow, then you could be in for a long day," Jones said. While the 8 vs. 9 game is often unpredictable, both teams' feature telling stats in their favor. LSU has only lost back-to-back games once this season (the Tigers last lost to Auburn in the SEC tournament), while NC State holds a 17-9 record in March under Gottfried. Neither team wants to turn off the lights on their season just yet, and the Wolfpack hope to escape the NCAA tournament second round for just the first time since the 2011-2012 season. "We're hungry for more," Gottfried said. "You want more. So hopefully this is the year we can do some things." Opening tip is set for Thursday night at 9:20 p.m.